June is wrapping up on a high note! With historic movement in Washington, DC on immigration and marriage equality, and unprecedented celebrations at Pride events around the country, Asian American, South Asian, Southeast Asian, and Pacific Islander (AAPI) lesbian,gay, bisexual, and transgender (LGBT) communities have been at the center of the action! Intern Corner: We are pleased to welcome interns Steven Cong and Elizabeth Duthinh to Team NQAPIA this summer. Check out their reflections and observations every week on our blog. This week, they offer their take on what’s been an historic week in the nation’s capital. Immigration: NQAPIA took our communities’ voices to Capitol Hill as the Senate took an historic vote on comprehensive immigration reform. 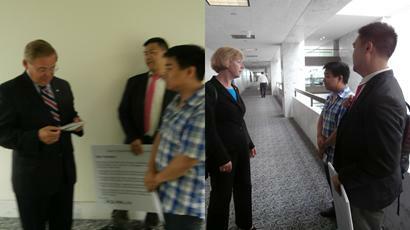 With Tony Choi, a queer undocumented immigration from New Jersey, we delivered 2,700 postcards to the Senate, meeting with Senators Tammy Baldwin (D-WI) and Bob Menendez (D-NJ). NQAPIA Community Catalyst Awards: We are pleased to announce our annual Community Catalyst Awards this year, which will be held at the Queen Kapiolani Hotel in Honolulu, HI. 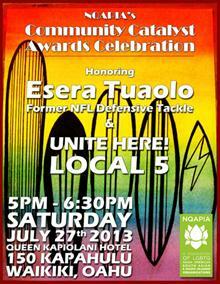 Join us on Saturday, July 27 as we honor former NFL football player and LGBT activist Esera Tuaolo and UNITE HERE Local 5. Check us out on Facebook for more information. 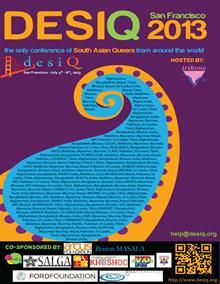 San Francisco, CA: Hundreds of LGBT South Asians from around the world are converging on San Franicsco this coming weekend for the DesiQ conference. NQAPIA is going to be there in full force July 4-6. For more information, click here. Supreme Court: NQAPIA monitored a number of issues taken on by the Supreme Court in their recently concluded session. While much of the news coverage (particularly in the LGBT media) has focused on marriage equality, NQAPIA weighed in on cases that were decided on issues such as Affirmative Action and Voting Rights. We joined a national statement from the LGBT community expressing our disappointmenent on their ruling on Voting Rights. Employment Non-Discrimination Act (ENDA): Out & Equal released a new report that explores the discrimination LGBT employees face in the workforce. You can check out their report here. Social Security Administration (SSA): Transgender communities got good news this month when the SSA announced new policies that will improve people’s ability to change the gender markers on their identity documents, including their Social Security cards. Our friends at the National Center for Transgender Equality issued this factsheet explaining the new policies. 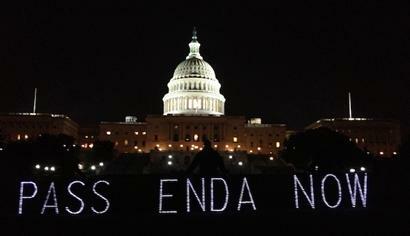 We need administrative relief on immigration NOW!